The month of January will go down as one of the warmest ones we've seen in the last 5 years. It was awful nice to have some warm weather for the crops that were struggling after coming through the very cold December. The warm weather is nice but it can bring on problems, one of the big ones this year is Take-All in Wheat. Take-all disease of wheat is caused by the soil-borne fungus Gaeumannomyces graminis var. 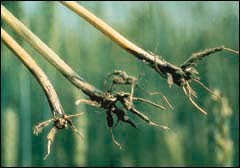 tritici (Ggt), which infects the roots, crown, and basal stem of plants. Take-all is common in western Oregon whenever consecutive crops of wheat are grown. 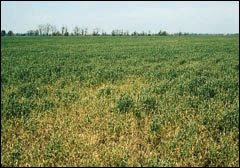 Grain yield may be reduced by as much as 50 percent in second or third crops of winter wheat. This publication has a lot of good information, it talks about the best way to manage Take-all if you have 2nd or 3rd year wheat on wheat.